Got my authors copies last night! The rest are en route to booksellers as we speak. Looks like Amazon will be delivering between 8/26 and 8/30. Get ready to get Googley! 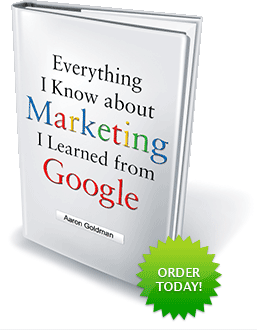 Set up Twitter account @LearnFromGoogle and bought the domain LearnFromGoogle.com to explain the project and stream the tweets (many of which I included in the book to break up the long-form copy and encourage dialogue pre/post publishing). Note: now I’m using @GoogleyLessons and GoogleyLessons.com. Build up a loyal fan base via your blog, Twitter, Facebook, and LinkedIn. Goal is to add RSS subscribers, followers, friends, and connections. This will show potential publishers that you have an embedded audience and platform for promoting your book. Seed some content into the community (eg, blog post, byline in a relevant trade pub) to generate a groundswell of interest prior to reaching out to publishers. Focus on generating comments, retweets, and other signals of interest. This will show potential publishers that this topic is highly regarded and buzzworthy. Don’t be afraid to flat-out ask people to support your efforts to get published. Publishers want to see that you have the ability to self-promote. Create dialogue with thought-leaders in your category via social media (eg, Twitter, Facebook, LinkedIn, etc.) Goal is to get them to name-check you in one of their posts, status updates, tweets, etc. This helps with awareness and credibility. Follow the social media efforts of publishers that you think are a fit. Join their LinkedIn groups, follow them on Twitter, fan them on Facebook. Goal is to get a feel for their style, hot buttons, catalog, etc. Engage them in these environments with dialogue about their current projects, not yours. Show them that you are a fan first, author second. That way, when it’s time to hit them up with your proposal, you’ll know what they’re looking for and they will recognize you as well. Along the same lines, connect via LinkedIn with individuals that work for the publishers you want to approach. Goal is to network your way to editors. This will show that you’re resourceful but, more importantly, hopefully land you a conversation with the right person at the publishing house. Don’t quit social media when you get the book deal. Your job has just begun and social media can help you keep people interested until the book is released. Share interview excerpts, behind the scenes stories and other nuggets that will build up anticipation. Also, create a way for people to sign up to be notified when the book is released and use social media to drive registration. Make it easy for people to share info about your upcoming book (or book-writing efforts if you don’t have a deal yet) by using “Share this” and other social bookmarking tools. Goal is to “go viral” and get people passing along info about your book to friends.